Hawaii Native Status: Introduced. 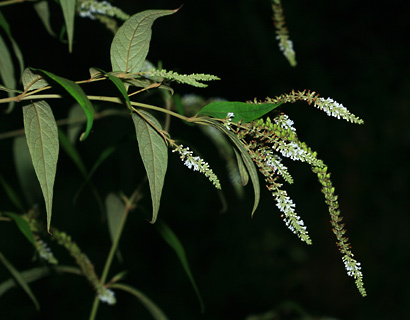 This naturalized medicinal and fragrance garden plant is native to Asia. Description: The flowers are in slender, tapering, often drooping, up to 8 inch (20 cm) long, terminal and axillary flower spikes. The individual flowers are small, bell-shaped, and have 4 ruffled lobes. The flowers are followed by dry, brown, rounded seed capsules. 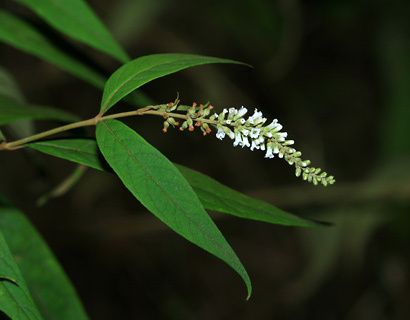 The leaves are green above, whitish green and hairy below, opposite to sometimes alternate near the branch tips, minutely toothed or not, and lanceolate in shape. The young stems are densely hairy. The plants are weedy and unattractive looking. Dogtail grows in pastures, along roadsides, and in other mesic (moderately wet) to wet, low to middle elevation disturbed areas. Fragrant – The flowers have a delightfully sweet, fruity, ambrosia fragrance. Poisonous – The plants are poisonous.